You are buying the FlexiFit 432 Full Face Mask Foam Cushion Small 400HC004 CPAP, manufactured by Fisher & Paykel. Fisher & Paykel is a leading manufacturer of CPAP machines and CPAP accessories. At ADW Diabetes, we offer the complete product line by Fisher & Paykel with great savings and excellent service. You are buying the FlexiFit 432 Full Face Mask Foam Cushion Small 400HC004 CPAP, manufactured by Fisher and Paykel. Fisher and Paykel is a leading manufacturer of CPAP machines and CPAP accessories. At ADW Diabetes, we offer the complete product line by Fisher and Paykel with great savings and excellent service. 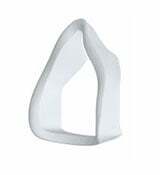 The FlexiFit 432 Full Face Mask Foam Cushion Small 400HC004 CPAP is a replacement Foam Cushion from Fisher and Paykel. The FlexiFit 432, a second generation Full Face Mask, takes patient comfort to the next level. It combines a new Soft Foam Cushion along with the contoured Silicone Seal to provide an even better seal and more comfortable fit.